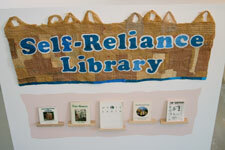 Temporary Services, Self-Reliance Library, 2010, collection of books by various authors selected by Temporary Services. Photo courtesy of Temporary Services. The Chicago-based collaborative artists’ group Temporary Services has gained national and international attention for its experimental methods and strategies for making and displaying art. Through social actions, do-it-yourself projects, publications, and public interventions, the artists Brett Bloom, Marc Fischer, and Salem Collo-Julin aim to raise awareness and create dialogue about social, economic, environmental, and political issues. This interactive installation combines older and more recent works, giving an introduction to the group’s artistic practices while presenting new material. Works in the exhibition include Designated Drivers, a project involving 20 artists who have been invited to contribute work loaded onto flash drives that can be viewed or downloaded by visitors, and Self-Reliance Library, which includes many of Temporary Services's own publications on creativity and alternative living. Temporary Services, Designated Drivers booklet, 2011. Courtesy of Temporary Services. Full size from the Temporary Services web site. Support for this exhibition is provided by the Illinois Arts Council, a state agency. Designated Drivers has been funded through The James B. Pick and Rosalyn M. Laudati Fund for Arts Computing, with support from The Alice Kaplan Institute for The Humanities and the Department of Art Theory and Practice at Northwestern University.